Background: Acute radiodermatitis caused by radiotherapy (RT) among cancer patients is a common side effect with the incidence of 90% higher showed in literatures. It can not only influence the therapeutic program but also bring suffer to patients and impair their quality of life (QOL). We performed a randomized, controlled, open-label study to evaluate the efficacy and safety of external treatment with TCM, treating the irradiated skin in one group with ‘Erhuang Decoction’, while leaving the other group untreated. Methods: The acute skin reactions were classified according to the RTOG scores. Patients with skin reaction of 2 to 3 grade were eligible and those with the same skin toxicity grade level were randomized to TCM group (n = 39) or control group (n = 37). Patients in TCM group were instructed to apply the irradiated skin with hydropathic compress using ‘’Erhuang Decoction’ 20 min for each time and 3 times a day for one week. Symptoms of skin lesion, pain and QOL were evaluated on baseline and a week later. Both groups were educated with nursing knowledge during RT. Results: 76 cases of breast cancer (45 cases) or lung cancer (31cases) were eligible. 39 cases were in TCM group with 35 of grade 2 and 4 of grade 3 while in the control group there were 34 cases of grade 2 and 3 of grade 3. There was no statistical difference between the two arms in gender, age, Karnofsky score and grad of skin lesion (P>0.05). The average treatment time for grade level decrease in TCM group is 3.26±1.61. We observed a complete response in 27 (69.2%), improvement in 10 (25.6%) and no failure was found in the TCM group which had statistical significance (P<0.01) contracting with the control group which had 13.5% patients aggravated and 86.5% were stable. Pain released in TCM group (Pain score 5.48±1.33 VS 2.06±1.27, P<0.05) and there is no improvement of pain in control group. QOL of TCM group improved with Karnofsky score 79.26±5.25 VS 88.56±4.69 (P<0.05) after treatment which was higher than in control group (72.37±5.85?P<0.05). There was no side effect found with ‘Erhuang Decoction’. Conclusion: Chinese herbal medicine ‘Erhuang Decoction’ for external use may be an effective and safe treatment for acute radiodermatitis. Footnotes: This abstract was selected for oral presentation at the 10th International Conference of the Society for Integrative Oncology (SIO) in October 2013. 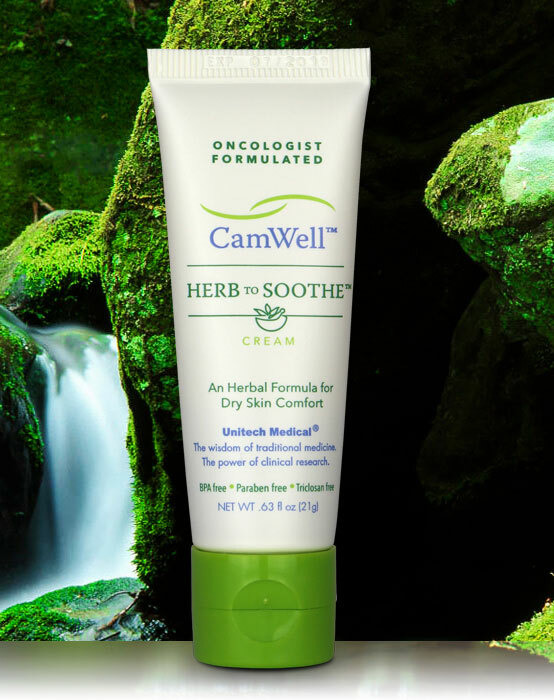 The formulation of CamWell™ Herb to Soothe™ is the same as ‘Erhuang Decoction’ above in this randomized, controlled, open label clinical study.